We’re glad to make our way to CeBIT again. After receiving remarkable response and appreciation for last year participation from Australian audience in CeBIT, ANGLER Technologies, a decade-old, pioneering Offshore Software Development Company specialize in offering outsourced product development and IT outsourcing services is participating in CeBIT Australia 2014 for the 5th progressive year is to be held on 5 May, 2014 – 7 May, 2014 at Sydney Olympic Park, Australia. At this most far reaching IT Exhibition and Business Technology Event in Asia Pacific locale, ANGLER has continually showcased its ability and imparts its method for attempting to the new advances in IT industry. Our executives persistently investigate courses with which we can add worth to your association. Our staffs are overall prepared to keep pace with the most recent advances which might empower clients drive greatest esteem out of their plan. With our abundance of experience, we offer Outsourced Product Development (OPD) for ISVs, Dedicated Offshore Development Centers (ODC), Mobile App Development, Open Source Development, Custom Software Development and Web Design & Online Marketing Solutions that conceivably run well with yours and end-customer needs. By visiting our booth at Stall Number: Q16 at CeBIT AU 2014, you can get some other data on our Offshore Outsourcing Services incorporating Outsourced Product Development (OPD) & Support, Custom Software Development, Outsourcing & Maintenance, Software Testing Services, Offshore Staffing & Managed Services with a mix of engineering aptitudes incorporating Open Source Technologies like PHP / MySQL, RoR, WordPress, Joomla, Magento, Drupal, and so forth, Microsoft Applications like Net, Infragistics, SQL Server, and so on, Mobile Application Development abilities like iphone / ipad, Android, Blackberry, Symbian, Windows Mobile, Social Media Applications and significantly more. Throughout the years, ANGLER has appropriated respectable notoriety for improving greatly refined programming applications and provisions that serve both the buyer and business sector sections. In this noteworthy occasion, we will be showing our existing product lineup incorporating Fleet Management Solutions, Time & Attendance Solutions, E-Commerce Solutions, Quality Management Software, Survey Builder & poll Management software, Web/Mobile Based Event Management Software, E-Learning & Assessment Solutions, Corporate Instant Messenger, Visitor Management Software, Content Management System (CMS) Solutions, CRM / SFA Helpdesk, HR , QR Code Generator and Custom ERP Solutions. Register with us online and get free tickets to reach us at CeBIT Australia 2014 in Stall Number: Q16 and take a gander at our aplenty of creative products and innovation results that help to achieve your particular and expert objectives all the more effectively. You can attain optimal execution and proficiency like at no other time by building long haul association with us. 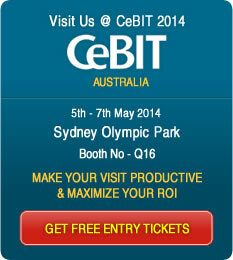 We anticipate seeing you at CeBIT Australia 2014 in Sydney Olympic Park, Australia.